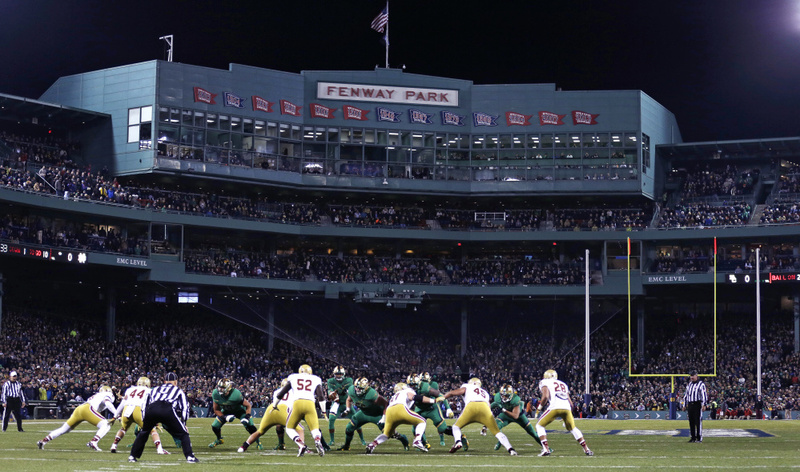 The Black Bears play UMass at Fenway Park on Saturday as part of the Fenway Gridiron Series. Jason Matovu grew up in Cambridge, Massachusetts, about 20 minutes from Fenway Park. Drew Belcher grew up in Reading, about 35 minutes away. They’ve both been to Fenway Park many times as fans but never dreamed as kids of playing for the Boston Red Sox. Football was their sport. But on Saturday, they’ll get to play at Fenway as members of the University of Maine football team (4-4), which faces Massachusetts (2-7) at 4 p.m. While the games bring added revenue to Fenway, they bring prestige to the teams playing there as well. “There is certainly a mutual benefit,” said Lev. “Part of the value for us is showcasing Fenway and bringing new fans into the ballpark. When you bring in new football fans, or in the case of Irish hurling where I’d venture to say a majority of the people in the ballpark have never been there before, hopefully there’s some residual value. The game comes at a good time for Maine, which had its playoff hopes dashed with last week’s 31-17 loss to Delaware. Playing at one of America’s most iconic ballparks has added a level of excitement to the game that otherwise might not be there. Maine’s bench will be directly in front of the Green Monster. “I’m looking forward to seeing it up close and personal,” Matovu said. “Hopefully I’m going to be able to get a couple of pictures,” said Belcher. And it’s not just the players who are excited. Head coach Joe Harasymiak, who grew up in New Jersey, said he’s sure to be a little awestruck, too. “When we were playing home run derby in the backyard with our friends, it was always the Green Monster. It’ll be cool to stand there on the field and look up at it. That the Black Bears are playing Massachusetts, a Football Bowl Subdivision team with more scholarships and a larger roster, adds another level of interest. The former Yankee Conference rivals are meeting for the 58th time, first since the Black Bears defeated the Minutemen, 24-14, at Gillette Stadium in 2013.